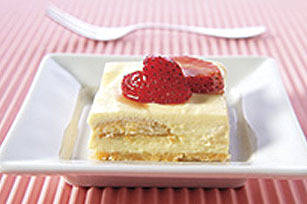 Try a shortcut to strawberry shortcake with our super Strawberry Shortcake Squares. Made with vanilla wafers, pudding and whipped topping, this no-bake dessert is a summer favourite. Crush 40 of the wafers; mix with 3 Tbsp. of the sugar and the margarine until well blended. Press onto bottom of 13x9-inch pan; set aside. Pour milk into large bowl. Add dry pudding mixes. Beat with wire whisk 2 min. or until well blended. Gently stir in whipped topping. Spread half of the pudding mixture over crust; top with remaining 24 wafers. Cover with remaining pudding mixture. Refrigerate at least 3 hours. Meanwhile, toss strawberries with remaining 1 Tbsp. sugar. Cover and refrigerate until ready to serve. Cut dessert into 24 squares. Serve each square topped with about 2 Tbsp. of the strawberry mixture. Refrigerate leftovers. Instead of refrigerating, freeze dessert for 1 hour before cutting into squares to serve. Garnish each square with a dollop of additional thawed Cool Whip Whipped Topping and a Nilla Wafer. Place 40 of the wafers in large resealable plastic bag. Use a rolling pin to crush the wafers in the bag. Add sugar and margarine; press down bag to remove excess air, then seal bag. Squeeze bag until mixture is well blended. Empty contents of bag into pan. Use the back of a spoon or small measuring cup to firmly press crumb mixture onto bottom of pan.